This Australian-designed 4x4 camper proved itself in the Outback, and it looks ready to tackle anywhere else. 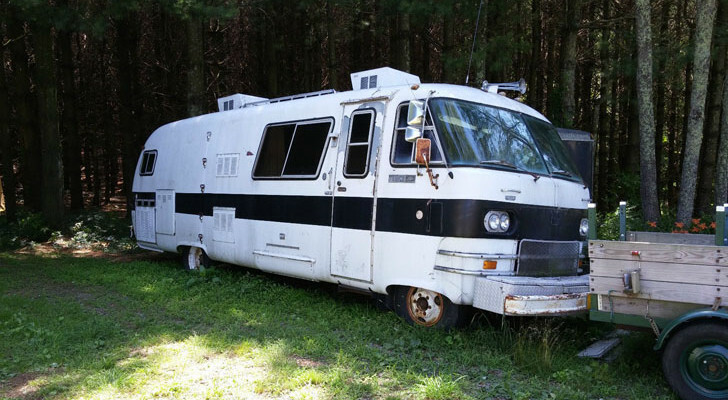 It used to be that to get the true off-road experience, the RV had to be left where the road met the wilderness, but today’s designs include many that will take you as far as a vehicle can go. The Earth Cruiser is one of those, designed to get you as close to the frontier as you care to go, without leaving the comforts of home behind. 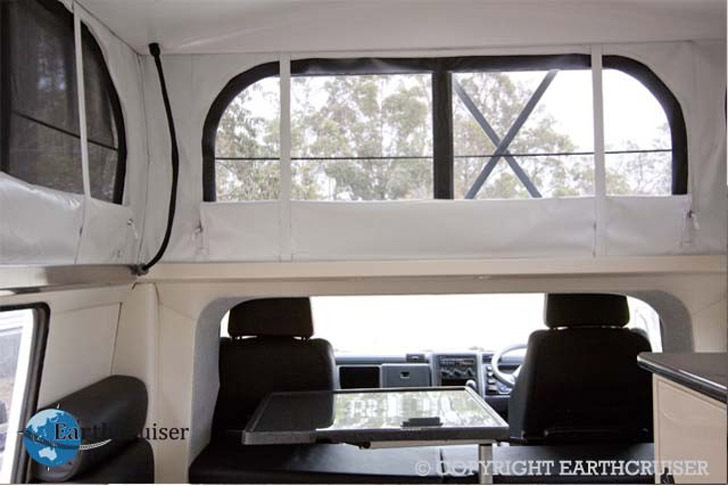 Earth Cruiser is a rugged off-roading RV with all the needed amenities. 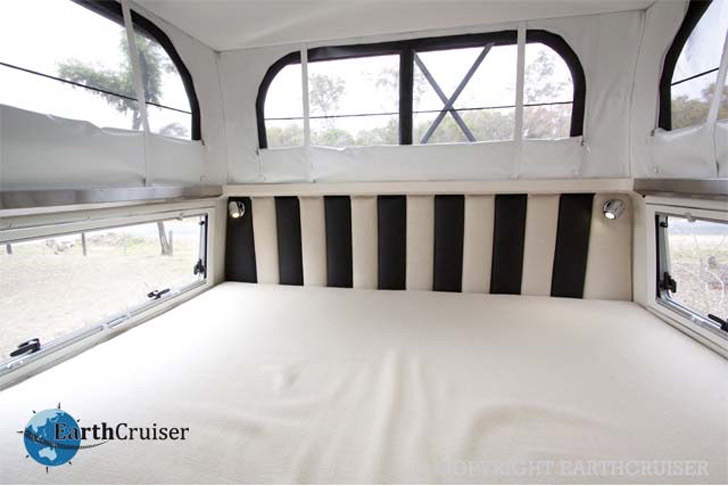 The Earth Cruiser design is focused on three things: sustainability, practicality, and comfort. 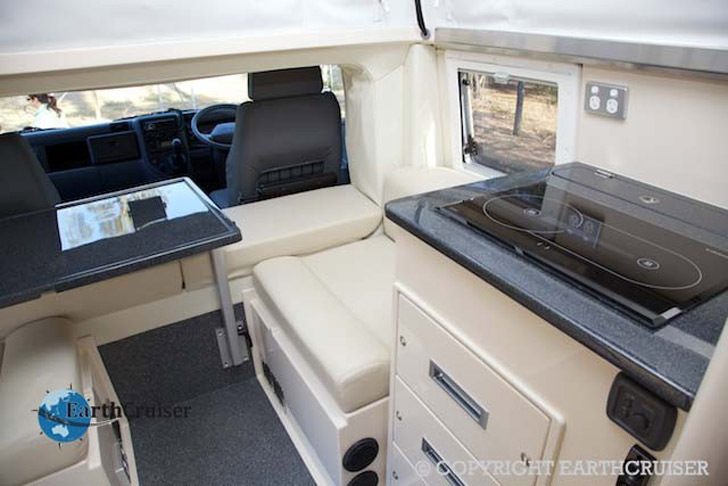 The Spartan interior is well-built and designed for comfort without the flash of a motorhome-style RV. The cabin is designed to expand when parked, with an elevating roof that pops up to give full head height overhead, and adds windows along the top of the cabin. 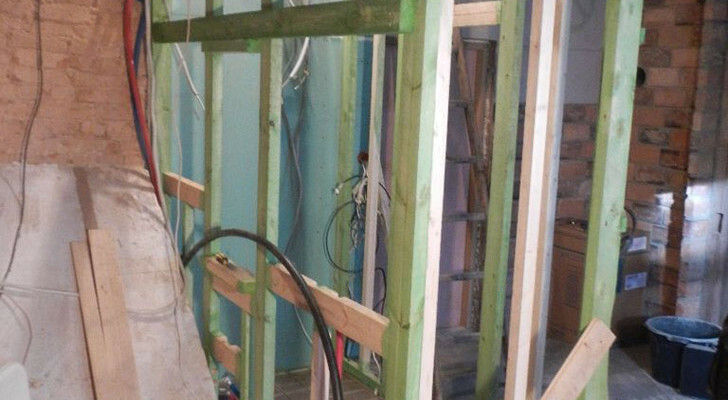 The Earth Cruiser on site with the top in the up position. 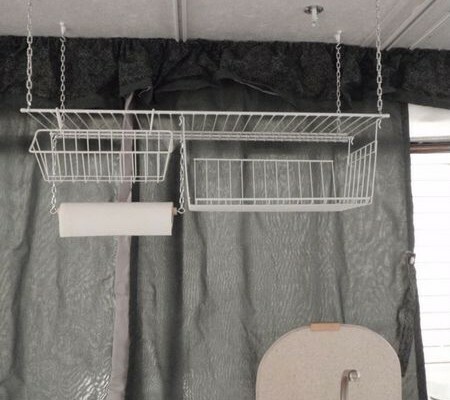 Much like a Maggiolina rooftop camper, the collapsible roof provides additional camping space, but is designed to do a couple of very important things. First, when collapsed, the cabin is no taller or wider than the cab of the truck, making tighter trails accessible. Second, since the Earth Cruiser is designed with the globe trotting adventurer in mind, the collapsible roof means the Earth Cruiser can be loaded into a freight container for shipping around the world. 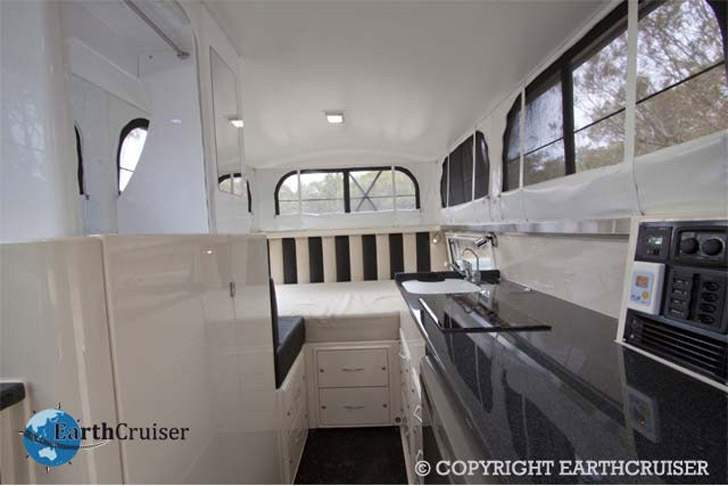 Earth Cruiser’s kitchen, facing the rear, note the windows in the extended top. 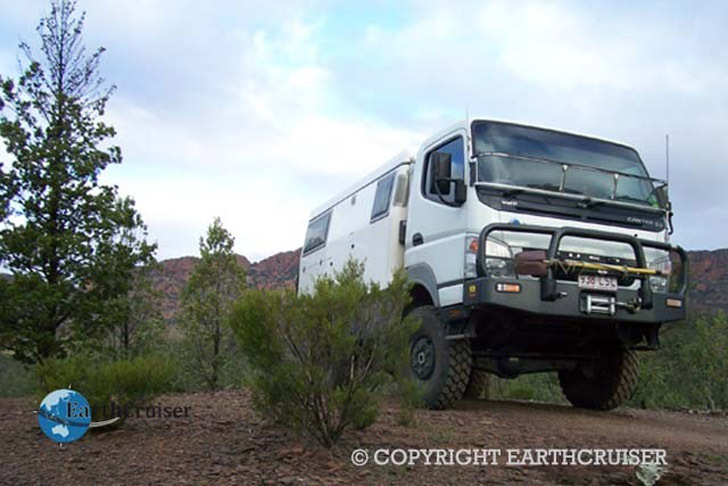 The Earth Cruiser is designed and tested in Australia’s rugged outback, one of the most challenging environments on, well…the Earth’s surface! 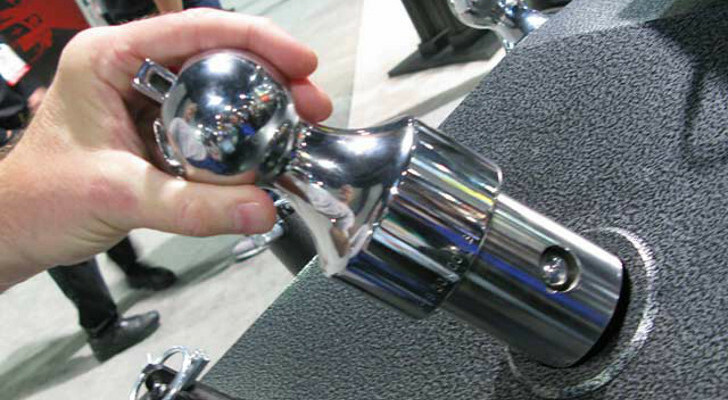 To get the product to market, Earth Cruiser moved production to the State of Oregon in the United States. For the space and features, the price of $175,000 places it mid-range in the off road, off-grid luxury market. 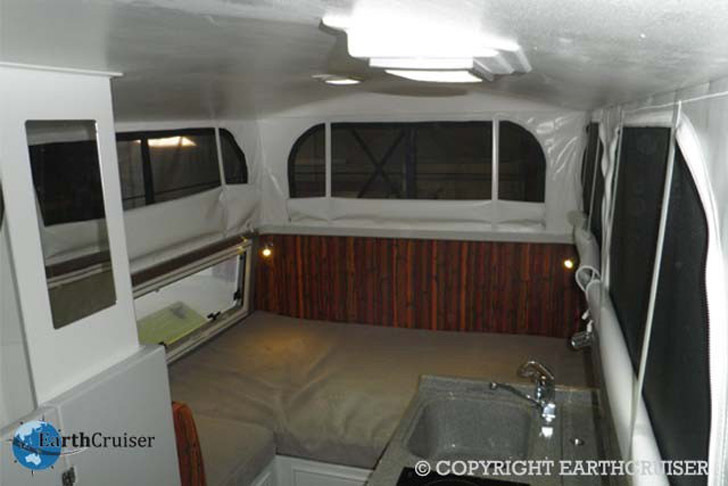 A view of the rear bunk, with the bathroom door on the left. 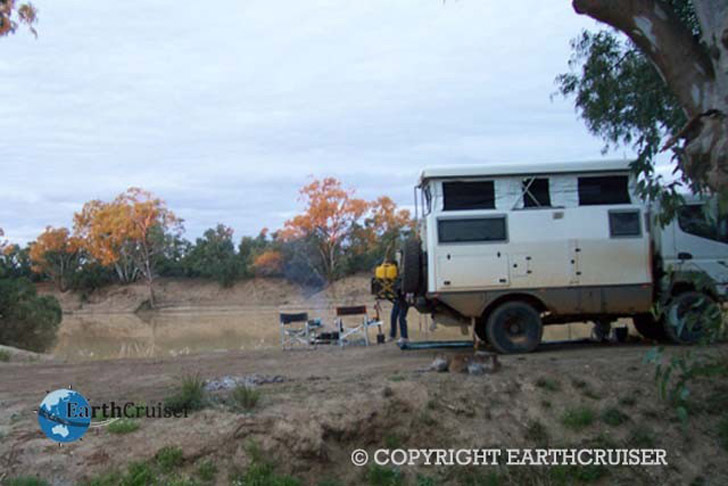 All of the Earth Cruiser’s systems are run from the truck’s solar power system, except for space heater and water heater, which is run from a diesel powered generator. The trucks are built on three truck platforms from Fuso, Isuzu, and Iveco. All of them are 4×4 equipped. 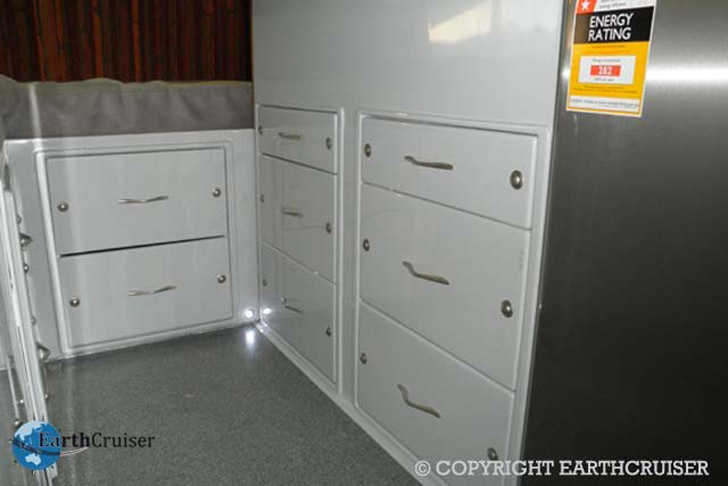 Earth Cruiser’s ample storage resides behind these locking drawers, for safety in transit. The platforms were chosen with rugged, long running operation and wide availability, making repairs simpler around the world. Everything about this RV seems to be thought out well. One trivia note: the truck is built less than the maximum 22 feet allowed by the United States National Park Service, one of the most demanding set of regulations, to make sure the vehicle will be welcome at any of its facilities. A view toward the cab, note the glass cook top stove. Their website is fun, with a lot of cool photos of the Earth Cruiser in action and one really neat feature for any kid-at-heart: paper plans for making your own Earth Cruiser model! Click on the Create Your Own Earth Cruiser link to open up a printable PDF that allows you to create a paper version of one of these rugged off-road, off-grid RVs. 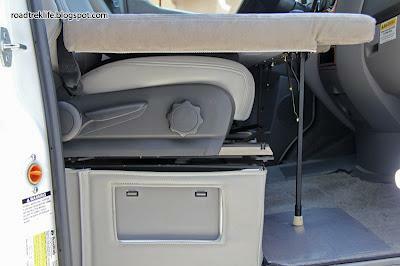 Collapsible dinette table right behind the cab. For more information on the Earth Cruiser, visit their website and check out the intro video below. 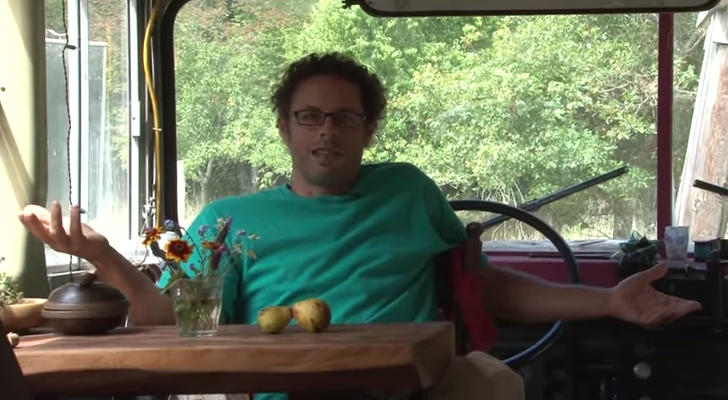 Watch A Motorhome Windshield Replacement Up Close. 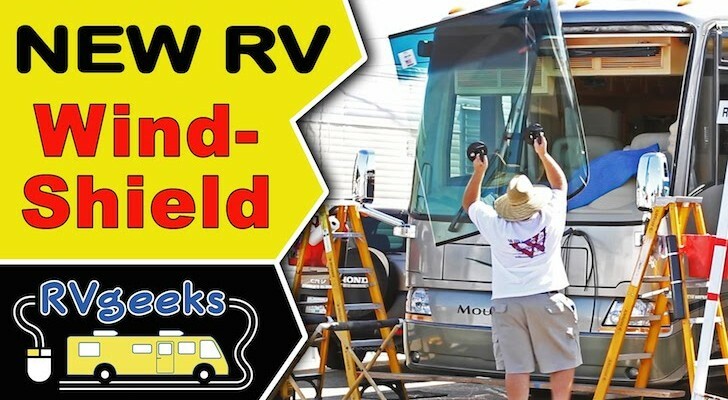 Learn How To Install New RV Glass On A Class A Motorhome.